As promised in my accompanying post, I'm going to keep this short and sweet. 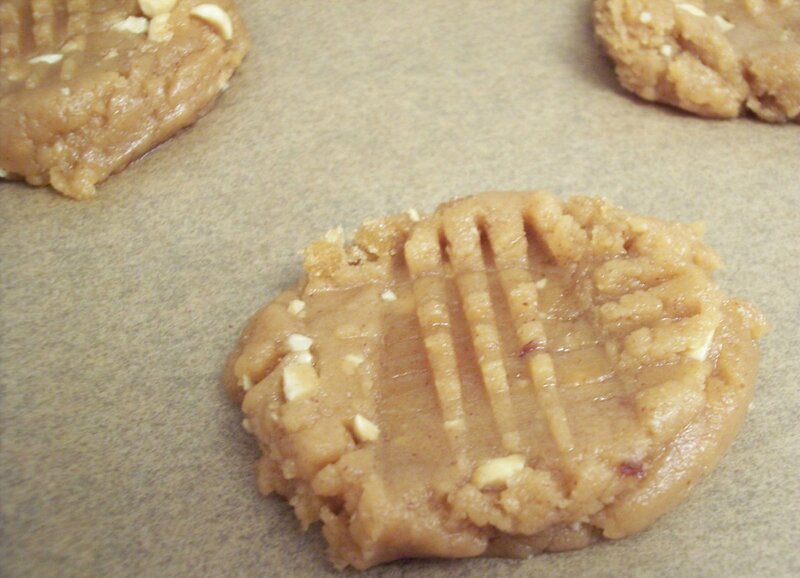 Below is an excellent vegan peanut butter cookie recipe. My only tip is to make sure that you actually sift the flour, as called for in the recipe. Unfortunately, I underestimated the sifter's importance (and didn't have one) so I attempted to "sift" the flour by using a mesh wire strainer. Yea, not such a good idea. The cookies, while delicious, ended up being somewhat flat & hard. I guess this is where you get to learn from my mistake. Aren't you lucky? 1.) Preheat the oven to 375 degrees F. Line 3 cookie sheets with parchment paper, or use 3 non-stick cookie/baking sheets. 2.) In a small bowl, combine the flour, baking soda, & salt. Set aside. 3.) Whip the egg replacer & water together in a blender or food processor, until it's thick & creamy. 4.) In a large bowl, combine the brown sugar, peanut butter, butter, milk, & vanilla. Beat at medium speed with an electric hand mixer until well blended. 5.) Next, add the egg replacer mixture to the bowl, beating just until blended. 6.) Then, add the flour mixture, ground peanuts (if using), & chocolate chips (if using), mixing just until blended. 7.) Drop cookie batter onto cookie sheets by rounded tablespoonfuls, about 2 inches apart. Flatten slightly in a criss-cross pattern with the tines of a fork. 8.) Bake for 10 - 12 mins., or until the cookies have set & are just beginning to brown. Do not over-bake. 9.) Remove from oven, & let the cookies cool on the sheet for 3 - 5 mins. before placing them on a wire rack. ha ha ha I wish I had been there for your wire-strainer sifting experience. I almost always use whole wheat pastry flour and have discovered that my sifter HATES it... about half of the flour never comes out... I'm not a fan of sifting. Thanks for the tip :-) Straining is definitely a pain, but worth it for light and fluffy cookies! Interesting. I always use a wire mesh strainer to sift and it comes out better than those consistently breaking sifters. If it is fine mesh, it should be fine and not effect the recipe in that way. Hmm. Well, I hope the next batch works out better for you! i didn't sift and they were fab! i did only cook them for 8 minutes (top sheet - bottom sheet 9). i'm the only vegan in the kids loved them too! mine also looked much better than the picture above! Hi Anonymous - I'm glad your cookies turned out so well! I've since figured out that my oven temperature was too high (I bought a thermometer), and that they were probably cooked for a little too long. Anyway, this pic was taken before they were baked - I didn't have time to snap a post-baking photo before heading out to my Christmas party. Maybe next time my cookies will look more like yours!